We have arrived to the last Tuesday of February. As we announced, on this day we will publish a sum of the next month events. If you want to have a look at the previous events in February click here. When I had to write this article it was a bit of a mess. If you are Catholic, you already know that on Sunday 27th March it will be Easter. What you do not know – I think – it is that Italy is full of rituals, celebrations and processions related to Easter time from North to South. I was really surprised about how many Easter events I need to mention and everyone with its own importance. It won’t be possible to list all of them and I choose the most significant ones. However I would like you to tell about the tradition of the flagellants. You have not to forget that March is the month of San Giuseppe (Saint Joseph), in fact in some Italian places there are events to celebrate this saint. March is also the month of women (on 8th March is Women’s Day) and marks the beginning of spring, the best time to start travelling throughout Italy. When there is an Italian bank holiday, it’s always a good moment to eat and drink with our family or friends. Christmas was only 2 months ago and in about one month Easter specialties will be prepared. Yes, Italian people constantly eat! Would you like to know which are the traditional sweets during Easter? I listed them region by region. Click here for part 1 and part 2. You have no idea what I am talking about? No problem! I wrote an article to explain how Easter period works and what we celebrate during those 40 days. In every place where you go during Easter there is something to do. Generally religious celebrations are very popular in southern Italy, but also in the North there are some celebrations not to be missed. We have already written about Easter in Italy. We talked about Fugassa in Veneto, Easter traditions of the Holy Week in Lombardy and in Umbria, what is eaten on Easter day in Rome, how to celebrate Easter in Sardinia, in Campania and in Friuli. I couldn’t mention every important Easter celebrations even if I would like to. Here you find some important events region by region. It is located in southern Italy along the Adriatic coast. You can visit Abruzzo for its high mountains or its coast. There is a part of this region less unknown related to traditions, food & wine, history. In this region there are many Easter celebrations and the towns where rituals take place are the main towns of Abruzzo. On Good Friday you can take part to the procession in Ortona starting at 5am, where men and women are dressed as they are in grieving. They go with dead Jesus statue and the Lady of Sorrows statue and sing. In Teramo the Processione della Desolata (i.e. procession of the desolate woman) reminds the anguished wandering of the Jesus’ mother looking for her son sentenced to die: it is one of the most ancient sacred representations in Abruzzo. Since 3 a.m. some people start to walk playing troccole. One hour later starts the anguishing wandering of Mary without citizens band, but only with dark veiled women singing the Passion’s song and carrying on their shoulders the wooden statue of Mary. The procession stops in 7 churches of Teramo. On the same day in Sulmona, the town of sugared almonds, it is held the Dead Jesus procession. The brothers of the confraternity of Saint Trinity, the most ancient one in Sulmona, wear the violet habit and walk along the street. The following day the Holy Mary is wearing a dark mantle because Jesus is dead. She leaves the church of Santa Maria della Tomba together with the devoted people keeping a candle in their hands. The procession stops in Piazza Maggiore, where she will expect the message that her son is resuscitated the day after and she will run towards him to hug him again. Moving to Scanno you will find the white hoods’ procession where the brothers sing sad songs whereas in Chieti a great amount of people gather together with coloured hooded brothers of 12 confraternities to take part into a procession dating back to 842 AC. In Casalbordino at the nightfall the ancient Dead Jesus procession starts silently and along the route living pictures represent Stations of the Cross. In Vasto there is a big celebration dedicated to the relics of the thorns crown of Jesus preserved in the Church of Santa Maria Maggiore. On Easter day in Lanciano the statue of Holy Mary, the statue of Saviour and the statue of San Giovanni will meet and the Holy Mary lets fall her dark mantle showing her white and green clothes. The celebration in Borgo di Introdacqua started maybe in the second half of 19th century and it is still alive. The Holy Mary statue is carried on the shoulder of those who won the public auction. Holy Mary heads for the opposite side of the square where there is her resuscitated son and they meet again in between the crying crowd. In Sulmona too the Holy Mary comes out of the church of San Filippo running towards her son. Moving northwards from Abruzzo the next region is Marche. I live here and religious events are not heart-felt everywhere, but there are some representations you have not to miss. In Cantiano there is La Turba dating back to the 13th century. Turba means ‘crowd’ and in fact at that time the crowd prays God and Holy Mary to stop their poor life due to wars and famines and to peace. In Loreto, one of the most important religious destinations in Italy, there is a Easter Passion Play in costumes with hundreds of players and extras acted along the streets in the town. Since the Middle Ages in Porto Recanati there is a procession called La Bara de Notte (the coffin at night). A group of 12 barefoot fishermen called sciabegatti (from sciabega that is the fishing-net) carrying a 5-meter high wooden machine representing a coffin. There is only one artisan who knows how to assemble the pieces of the machine. In Monterubbiano an Easter procession dates back to XIV century. On Good Friday women in grieving, Romans and the brothers of the Confraternity carry the coffin of Jesus decorated with precious velvets put on a 3-levels wagon. The procession takes place only in the even years! If you are looking for something captivating you have to take part into the Dead Jesus procession in Cagli. More than 400 hooded barefoot brothers dressed with tunics and holding a torch walk along the streets accompanied by the sound of drums. This region takes up a special place in my heart and I will dedicate an article only for the religious rituals taking place during Easter time. There are too many events and I would like to describe you everyone in the next days. Sicily is one of the regions where Easter and the other religious rituals are strongly keeping alive. Here I will describe two events that are not too much religious. Archi di pane occurs in San Biagio Platani. The ritual was born in the 18th century. Two confraternities prepare archi (i.e. arches) with natural materials like canes, sallows, asparagus, cereals, breads and so on. Each of these materials is a symbol with its own significance. The most important part is the central one where resuscitated Jesus and the Holy Mary meet on Easter day. Il ballo dei diavoli (i.e. evils’ dance) is typical of Prizzi. On Easter day some people wear paper masks of evils and of death. Evils wear also a red coverall, a goat skin on their shoulder and a chain in their hands. The death has a yellow coverall carrying a crossbow. They bother people to grab them without let them go until they give money. These masks will empede the meeting between Jesus and his mother. Two statues brought on the shoulder and accompanied by two angels. Every time Jesus and the Virgin meet, the masks start to upset, jumping and running between the statues. Only at the third attempt the statues will be able to meet while the angels hit the evil spirits. A mixture of religion and profane. We are in north-western Italy. In this region there are two important locations: Savona and Ceriana. In the first one an evocative procession takes place on Good Friday and hundreds of brothers of the regional confraternities will walk along the streets in Savona together with an orchestra of 300 people. In the second one the event lasts one week starting on Palm Sunday. On Holy Thursday wood carving horns are played by the Confraternities and in the evening after the Last Supper they sing religious songs. On Good Friday they walk along the streets in Ceriana. 8th March is dedicated to women, but it’s not a bank holiday. We use to give a bunch of mimosa flower as a gift to women remembering the day. 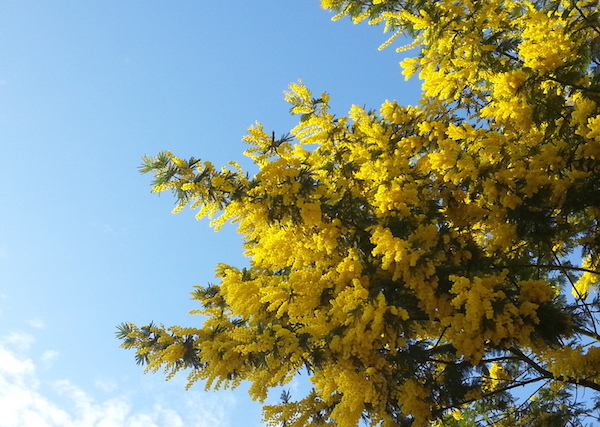 I love mimosa and its smell, also because it reminds me that spring is coming. On the same day the National Day of the forgotten railways was established. Everywhere in Italy there are railways no more used and this event aims to enhance the routes by organizing walking tours. 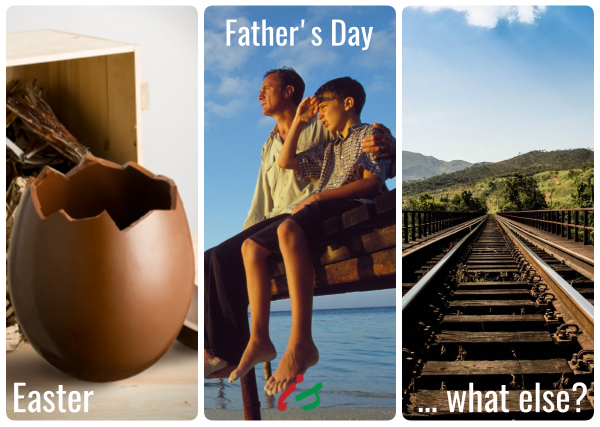 On 19th March it will be Father’s Day and the day of San Giuseppe. Giuseppe was the father of Jesus. In some parts of Italy on this occasion there is the habit to prepare particular sweets in honour of the saint. For example zeppole di San Giuseppe that are fried doughnuts topped with custard and a candied cherry prepared in Naples. Besides there are particular celebrations taking place in Italy. For example in Ortona (Abruzzo) where fathers are celebrated with a costumed parade ending in Piazza San Giuseppe. Here the cortège gives a lily to the priest for devotion to San Giuseppe. Last year Giorgio talked about the celebration of the Saint throughout Sicily. Remember that from 4th to 6th March in Norcia (Umbria) there will be the Trade Exhbition of the Black Truffle. For fourther information click here. On 13th March Sanremo in fiore has been taking place since 1904 in Sanremo (Liguria). The town is famous for its flower production. We can say that is the Italian competitor of the Netherlands. The parade of flowered floats is scheduled at 10 am.